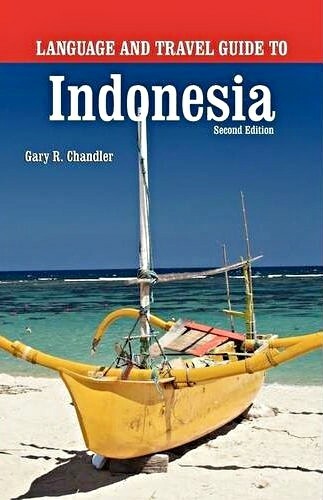 Indonesia is a very large and diverse country. With 18,110 islands, 6,000 of them inhabited, it is the largest archipelago in the world. The population of 240 million people is composed of about 300 ethnic groups who speak more than 250 different languages. While Bali and Jakarta are often the destinations of choice for business and pleasure, let’s explore some other top tourist attractions in Indonesia. Yogyakarta: This is the historic and cultural capital of Java and Indonesia. The sultan of Java lives here in the Kraton. The area features some of the most impressive ancient monuments in Indonesia–Borobudur and Prambanan. Borobudur is the largest Buddhist monument in the world, while Prambanan is one of the largest Hindu monuments in the world. Mt. Merapi is visible from Yogyakarta and most of the region. 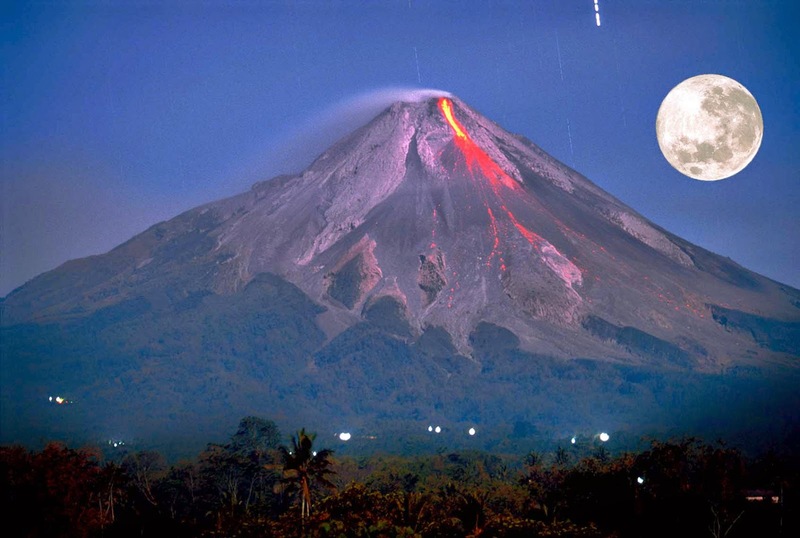 Merapi is one of the most active volcanoes in all of Indonesia. Yogyakarta also is famous for its arts, especially batik fabrics. Bicycles and horse-drawn carts are still very common forms of transportation in the region, which gives the area a special charm, despite its sprawling size. Yogyakarta also is a university city, which gives it even more character. Komodo Island: The only way to reach Komodo is by boat, which is an experience that can’t be missed in this island nation. Most visitors arrive on large boats, which is a first-class way to eat and sleep in this extremely remote region. The Komodo dragons live on three islands in the area–Komodo, Rinca and Padar. A few have even crossed the strait to the western tip of Flores. These arid, volcanic islands are inhabited by about 5,700 giant lizards, which grow as large as 12 feet long (three meters). They exist nowhere else in the world and are of great interest to scientists studying the theory of evolution. 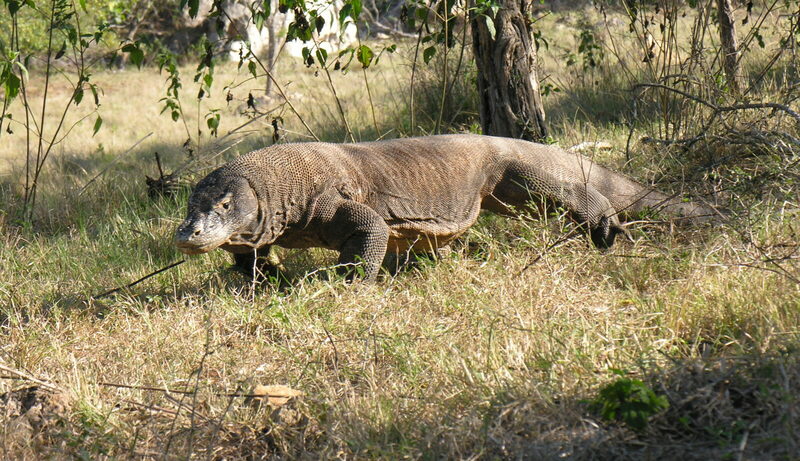 The local villagers call the Komodo dragon ora, which means land crocodile. The dragons are normally a sandy brown with dark markings against very coarse and dry scales. They have a long neck and a tail that is longer than their body. They have strong, sharp claws that are used in combat with other dragons and during feeding frenzies. The rugged hillsides of dry savannah and pockets of thorny green vegetation contrast with the brilliant white sandy beaches and the blue waters surging over coral. Although the dragons are the primary attraction to the area, these waters offer some of the best scuba diving in the country and the world. 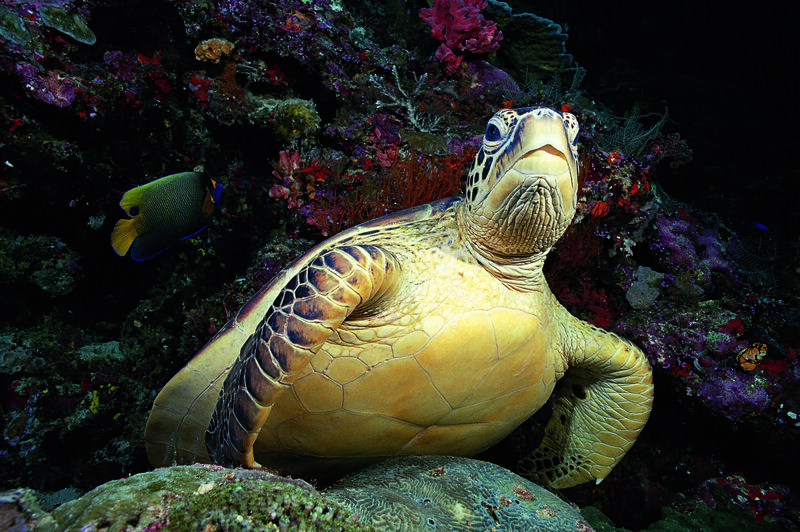 The marine fauna and flora are generally the same as that found throughout the Indo Pacific area, though species richness is very high, notable marine mammals include blue whale (Balaenoptera musculus) and sperm whale (Physeter catodon) as well as 10 species of dolphin, dugong (Dugong dugon) and five species of sea turtles. Camp Leakey: Tanjung Puting National Park is located on the island of Borneo in the Indonesian province of Central Kalimantan. The park is a popular ecotourism destination, with many local tour companies offering multi-day boat tours to view wildlife and visit the research centers. Wildlife include gibbons, macaques, clouded leopards, sun bears, pythons, crocodiles and – most famously – orangutans. Unfortunately the park is heavily threatened by illegal logging and forest clearing for agricultural uses., this is your best opportunity to see orangutans in their own habitat. Some are being rehabilitated, while wild orangutans also visit the area, which is not fenced. 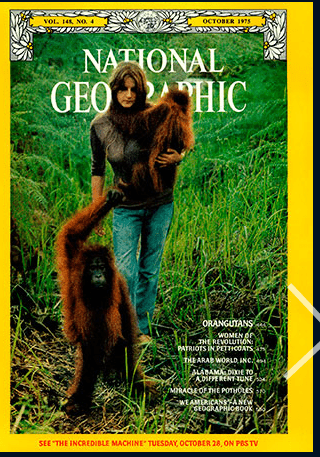 With some luck, you might meet, Dr. Birute Galdikas. In the early ’70s, Dr. Galdikas traveled from Los Angeles to the Indonesian province of Central Kalimantan on Borneo island to study the red-haired primates. She has spent much of the last 45 years on the island, researching the orangutan and fighting to protect its habitat. Bunaken: Located at the north of the island of Sulawesi, Bunaken is one of Indonesia’s most famous dive and snorkeling areas. The island is part of the Bunaken Marine Park where you can see more than 70 percent of all fish species that live in the western Pacific ocean. 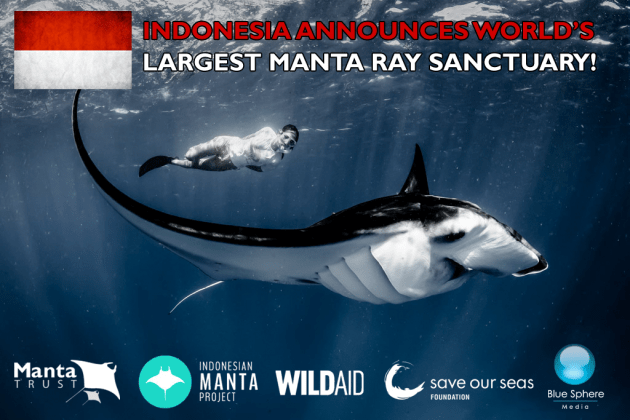 Indonesia is an epicenter of underwater biodiversity, hosting a greater variety of marine life than anywhere else on earth. The South China Sea, the Pacific Ocean and the Indian Ocean converge here, on the world’s largest archipelago of more than 18,000 islands, and the result is spectacular diving. Thriving off Indonesia’s vast coastline are more than 600 coral and 3000 fish species. The best time for diving in Bunaken is between April and November. 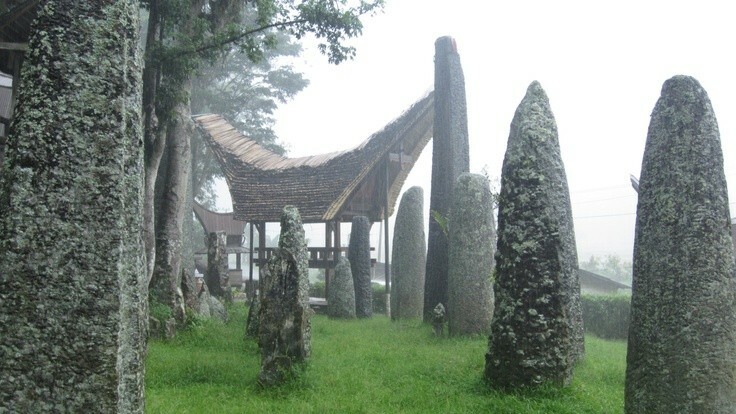 Torajaland: Also known as Tanah Toraja, this is a highland region of Sulawesi, home of the Toraja people. Torajans are famous for their massive peaked-roof houses and spectacular funeral rites. The region also features some interesting megaliths. 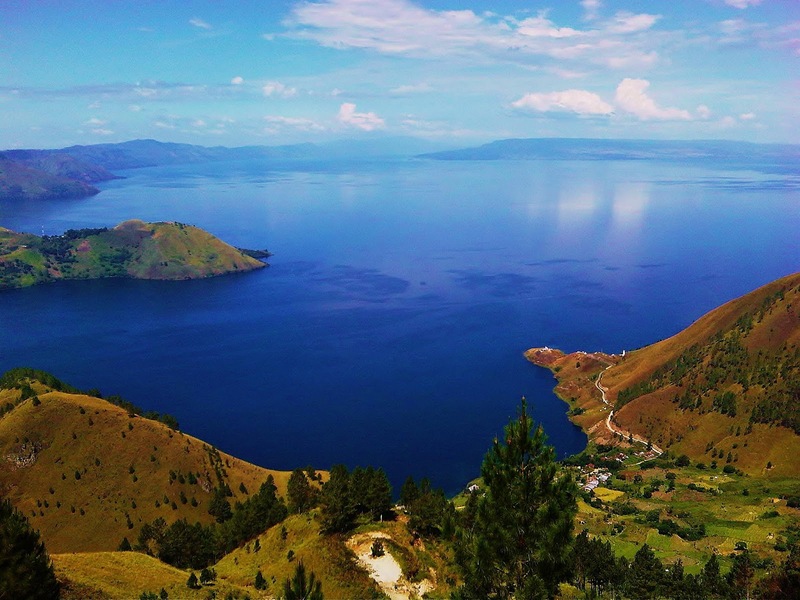 Lake Toba: Lake Toba is on the island of Sumatra. It’s an immense volcanic lake about 100 kilometers long and 30 kilometers wide. Formed by a gigantic volcanic eruption some 70,000 years ago, it is the largest resurgent caldera on Earth. Genetic estimates suggests that there were only a few thousand humans that survived the catastrophe. The island in the middle – Pulau Samosir – is the largest island within an island and contains two lakes. Tourists from around the world come here to relax and swim in the volcanically warmed waters. The volcanic activity of this region produces fertile land and beautiful scenery. It also contains rich deposits of coal and gold. Ubud: Perched high in the hillsides, Ubud is much cooler and greener than life on the beaches far below. Ubud is considered the cultural heart of Bali and one of the top tourist attractions in Indonesia. There are dance and music performances every day throughout the city as well as numerous art galleries and craft shops to explore. Although Ubud has long been valued as a great place to learn about Balinese culture. Tourism in Ubud boomed exponentially in the last decades. Fortunately, it only takes a short walk or bicycle ride to escape from the crowds and commercialism. An area called the monkey forest sits on the edge of town and its filled with wild monkeys that will beg you for food. Raja Empat: This is a fascinating diving destination near Papua. It’s a great region to see manta rays and other rare marine life. Over time, tourists mispronounced the name so much that even locals refer to the area as Raja “Ampat.” Don’t be fooled and please don’t perpetuate the error. Raja Empat means “four kings.” As with the best diving in Indonesia, this trip requires a live-aboard boat. The waters of Raja Empat boast more than 1200 marine life species. The reefs at Kofiau are filled with colorful soft and hard corals that hide myriad creatures while blue and gold fusiliers flow like living rivers of color overhead. These coral bommies and gardens harbor some of the highest marine biodiversity in the region. At Northwest Misool, a blue water mangrove maze of trees meets the color of the reef. If you’re a photographer who likes over/under images, you’ll want to take up permanent residence. The Passage is a narrow river of sea between Waigeo and Gam Islands, the coral here grows pretty much to the surface and you’ll find piles of nudibranchs, sharks, cuttlefish and octopus among the soft corals. 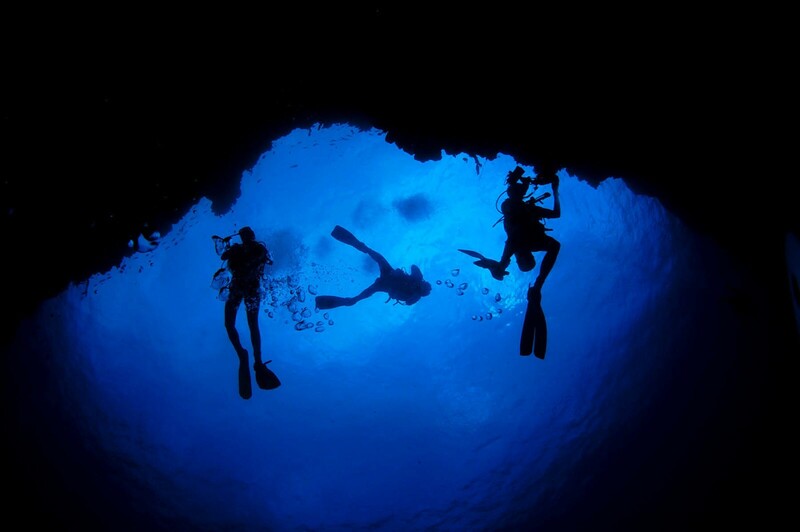 Wakatobi: Wakatobi is a world-class scuba diving destination. It’s drop-off is famed for its action and color, with everything from blue ringed octopus and ghost pipefish to resident sea turtles cruising past soft corals and gorgonians. Lembeh is renowned for muck diving. With a sharp eye, you’ll find banded snake eels, pygmy seahorses, octopus, scorpion fish and literally hundreds of extraordinarily well-camouflaged critters. Almost anything could be hiding in the black sand. Those who make the journey to Wakatobi are well rewarded. Above water, the islands are stunning. Below, the diverse and memorable house reef is home to creatures ranging from the small and strange to giant mantas and resident turtles. In addition, the readily accessible coral garden at Teluk Maya harbors Pegasus sea moths, pipe fish, and an endemic pygmy seahorse species. Many dive sites feature thick forests of vibrant soft corals, which hide lots of animals. Seamounts dominate the extraordinarily photogenic dive at Blade where sea fans, sponges and corals abound and seem to have positioned themselves in the most picturesque places on the reef.